Rev. Lorenza Smith and I had a good first full day in Egypt (Tues. Sept 17). After meeting with colleagues and talking with locals, we were ready to attempt to travel to El Minya, Egypt. (A city 4 hours south of Cairo where 30 of the 85+ church attacks took place in August of 2013.) Our first night (after striking out with many drivers) we met a man named Achmed outside our hotel who owned a nice car and committed to get us to Minya along with a translator. We agreed to meet at 7:30am on Wednesday morning. 7:30 arrived bright and early. After breakfast we met Achmed outside our hotel. He was there and on time and ready to take us to Minya. But we ran into a problem. There was no translator in the car with him. After some translation, Achmed informed us that his translator (who was his uncle) had slept in and was not able to join us on the trip to Minya. Not knowing the state of the town (after the military invasion…see the last post), Lorenza and I tried to get Achmed to find a translator (for our safety and communication) but he was unable to get one that day. After more broken communication we agreed to try again tomorrow and Achmed promised to find us a translator. We went back to our hotel discouraged but still focused on the mission at hand. These were the times Rev. Smith taught me a lot about traveling light and trusting in God. After discussing our choices together, Lorenza and I had our hotel bellman find us an English-speaking taxi driver (which was hit or miss due to the lack of tourism) so we could talk to him about traveling around Cairo to visit some sites affected by the protests and political fall out. After waiting for about 30 more minutes our bellman introduced us to a driver named Muhammad. And he spoke English! After walking to his car and talking with him about our plan, Muhammad began telling us his view about the political landscape in Egypt. Muhammad was a Sunni Muslim and favored the removal of President Mubarak in 2011 (although he thought Mubarak was an okay leader…just was in power too long). After the election of President Morsi, he (like the majority of Egyptians) grew frustrated with the Morsi administration, the disorganized government, and growing extremist views. He supported the removal of Morsi and the Army’s control of the interim government. He was very honest (with coarse language) about how he felt about the current state of his nation and displayed a sadness towards the division it has caused so many people. When it came to the USA. He loves American people (maybe because we were in his taxi. But he despised our Government and the Obama administration.) His lecture on the political issues in Egypt lasted for about 30 minutes. It was shocking to hear him say this. Not so much because he was refusing the money but it was the first time we heard it said in such a direct tone and point of view. 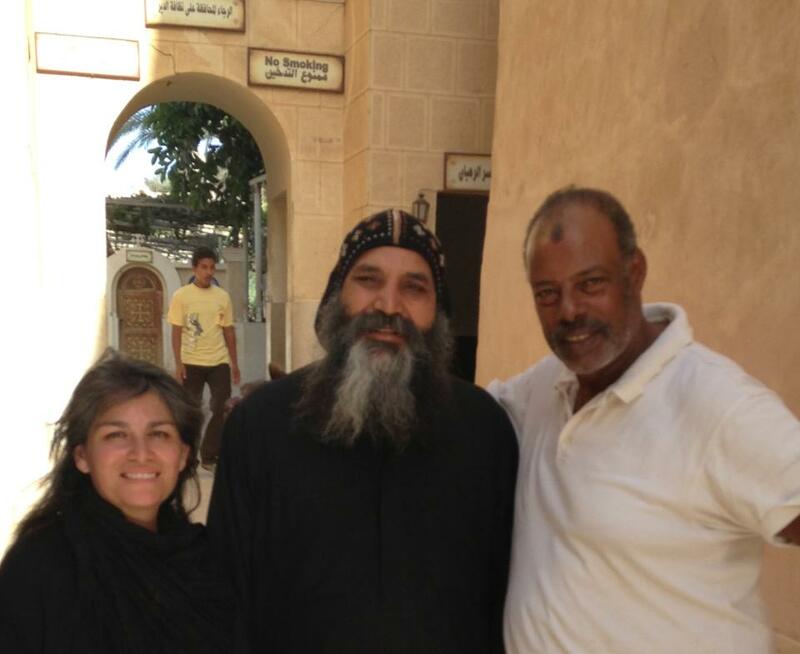 Would our lives be that much in danger visiting Minya and the burned churches? After more heartfelt discussion about our faiths he agreed to take us around Cairo (and other secure local areas) and show us the places affected by the resent unrest. He was excited to teach us the truth about Egypt and dispel the lies we hear from the media. It was not our first plan for the day but we were on the road and could communicate nicely with the driver. We were grateful for Muhammad’s honesty and willingness to teach us other points of views. For the next 2 hours (constantly fighting the Cairo traffic) Mohammad took us around Cairo and showed us many sites relevant to the protests and demonstrations. We saw barricaded squares, burned police buildings, political headquarters, attacked Mosques, etc. Ramses Square was one site we visited. (Read about it here.) It was interesting to learn about the political fallout through a visual tour. We even saw and heard the history of old sites such as the assassination location of President Sadat. Now, it would normally only take around 1 hour to get to Wadi Natrun however it took over 3 hours and we did not know the exact site of the monastery. To make it worse, Wadi Naturn is also the home of one of the largest Egyptian prisons where many Brotherhood members were detained after the protests. To say the least, it’s not a prime place to break down. 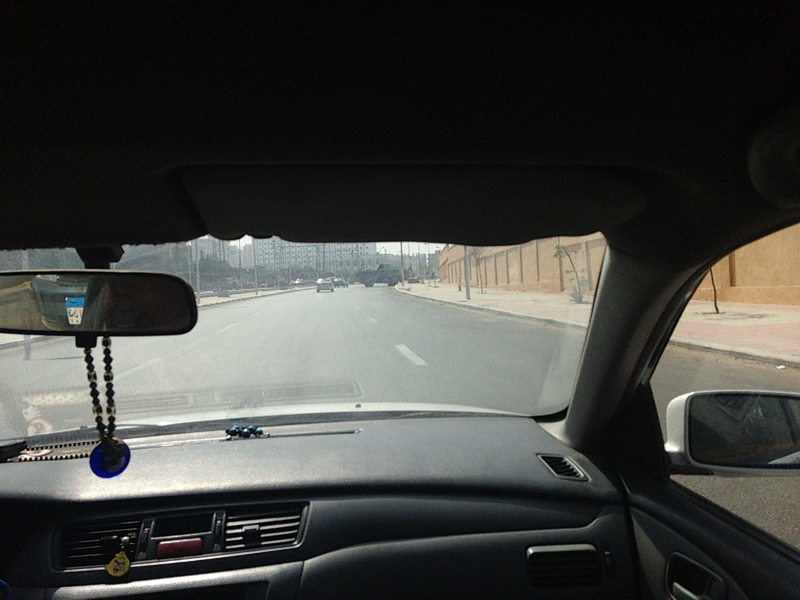 But luckily, after a few more directions and u-turns, Muhammad got us safely to the monastery! Due to the time we quickly left the car to tour the facility and Muhammad stayed by his car to smoke on a cigarette. Saint Pishoy monastery is one of the most visited monasteries in the country and the shrine of Pope Shenouda III of Alexandria who passed away in 2012. I remembered a lot about the history in 2006 but it was fun to tour without a group and wander the grounds. Monk Claudius greeted us at the main door and allowed us to walk freely around the property. 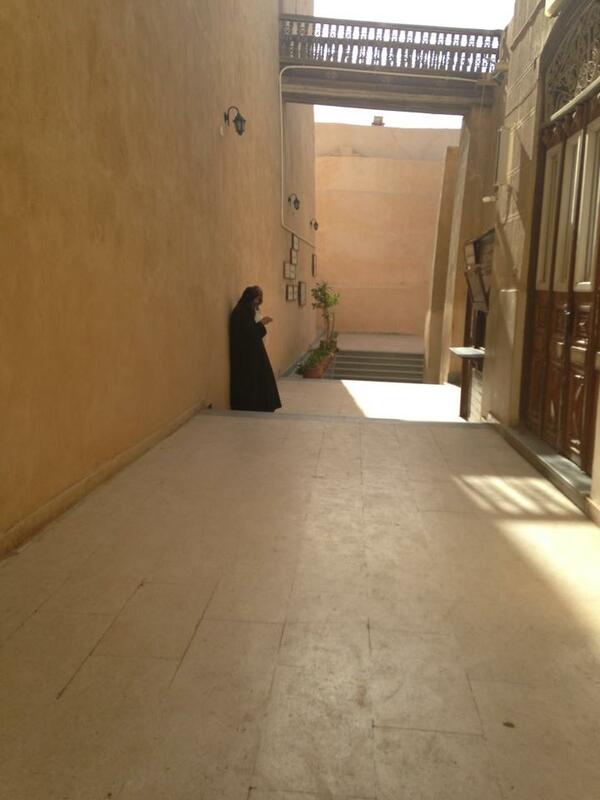 Lorenza and visited the original chapels and quietly observed the school groups touring the building. 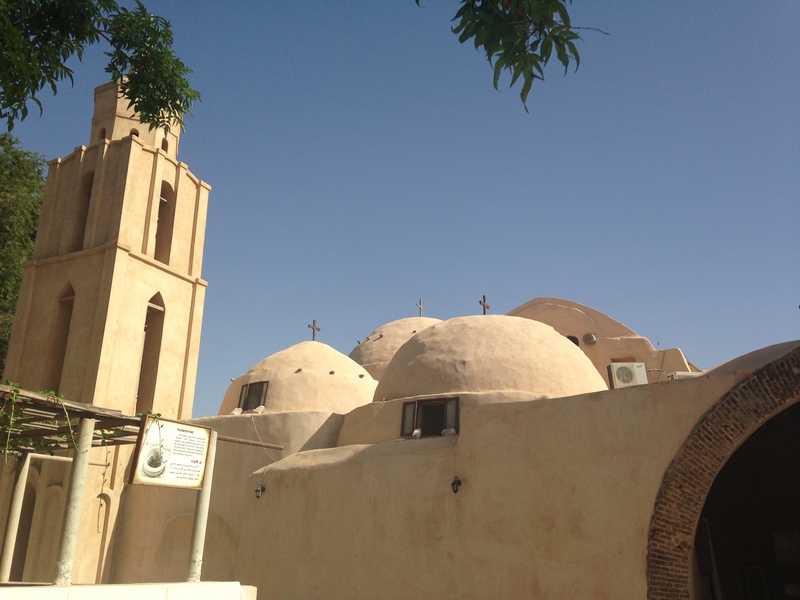 Its hard to image this Christian community has been around for 1000’s of years in the middle of the desert. Quietly but steadily serving the church. The Monk and Muhammed by the entrance. After visiting the living quarters and Pope Shenouda’s shrine we decided to look around outside and headed for the main exit. Unbeknownst to us our Taxi driver Muhammad had entered the monastery and started talking with Fr. Claudius at the entrance. As we walked up to the men we realized they were drinking tea and having a deep conversation about faith. It was a humbling site to see. As unintentionally as it might have been we left Muhammad in the parking lot once we arrived. Somehow, Fr. Claudius invited Muhammad to enter the gates and share tea with him while they waited for us to return. Here we are (two ministers) looking for a story of solidarity and we were too focused on the touring the campus and missing out on conversation. While we were acting as good tourists, the monk and Muhammad lived out right in front of us what it means to live in solidarity and compassion. Once we met back up Muhammad helped translate our conversation with Fr. Claudius who invited us to drink more tea in the public living room. He makes me lie down in green pastures; he leads me beside still waters; he restores my soul. He leads me in right paths for his name’s sake. Even though I walk through the darkest valley, I fear no evil; for you are with me; your rod and your staff—they comfort me. You prepare a table before me in the presence of my enemies; you anoint my head with oil; my cup overflows. Surely goodness and mercy shall follow me all the days of my life, and I shall dwell in the house of the Lord my whole life long. It seems so simple but why is it hard for us to live like this more often? It was an interesting a beautiful conversation. While we use the word “Coptic” to describe the Christians in Egypt, it was there we were reminded that the word simply means “Egyptian” in the native language. There is no division based on religion. In Egypt, so many people have a sense of unity and pride between the two faiths. Drinking tea our friends were begging us to consider: Even in severe differences that probably are life and death to many people, how can you live with the other or your enemy or your neighbor that you don’t like or you don’t agree with? In Egypt, you get to see the most beautiful side of that, and they do it well sometimes. But you also see the violent side of that decision. The monk and our taxi driver reminded Lorenza and I of this: In the end most people strive with loving your neighbor. What we would like to challenge is the images promulgated by media and extremists that such love is impossible. We like to think it is possible. Christ said it was possible. Christ made it possible. Watching the monk and taxi driver speak about the faith was an experience I will never forget. During the cadence of the conversation we could see them shaking their heads in agreement, then after awhile disagreeing with what was being discussed. Sometimes it seemed awkward. But in the end they peacefully let the issue go instead of focusing on the traditions that divide. After Muhammad and the monk finished their tea they hugged and proudly posed for photographs together. Before sunset we loaded back into the 35mph taxi and slowly drove back to Cairo just like we came. But something changed while we were in the desert. This trip, however it plays out, is not for me to create. Driving back to the city, we kept wondering, what could be accomplished in this world if we drank more tea with our enemies? Tomorrow was our last full day in Egypt. Would Achmed arrive (with a translator) and make it into Minya? It was not up to us to decide. We could only hope and go with what was given to us. This entry was posted in Egypt 2013, Uncategorized by jgavinrogers. Bookmark the permalink.